Don’t be afraid to do something just because you are scared of what people are going to say about you. People will judge you anyway, but when you take a step, you’d realize “you can do more”. 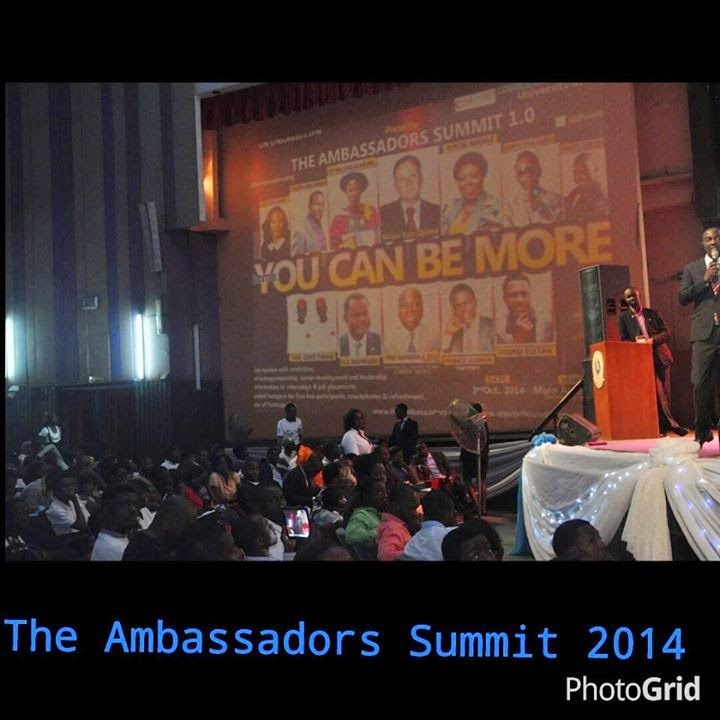 It was the “Ambassador’sSummit” early this month. I attended the programme and jotted down some points in my book (to post for those who weren’t privileged to attend the program). How to start typing it on here’s some real job for me*covers face* (because I type most of my write-up however way it streams in to my head using the memo pad on my phone). I made sure two of my friends attended the programme with me because I trusted the programme to be a great one. I’m not going to do too much in writing a report neither would i write about all the speakers but I’m going to make you realize how great this programme was by writing reasons on Why/how you can Be More”. Those reasons are culled from the points all the speakers made. The main motivational talk started with Kwame taking the lead as the first speaker, an engineer in aviation. Right from tender age, he had the passion to work in anything related to aviation. Kwame’s talk was inspiring as he made the audience realize the steps he took in a bid to make his passion turn to reality. (from L - R) : Kwame, Olaoluwa Hallowed, Bolaji Salami, Stephen Oguntoyinbo during the question and answer session. Hallowed Olalouwa who emerged as the overall best doctorate student with5.00 Cumulative Point Grade Average at the University of Lagos 2013/14 was the next speaker. He briefed his educational journey on how he ran two programmes simultaneously, it was not done before; neither has it been done after. He bagged his masters degrees simultaneously at age 19 and embarked for PhD programme in UNILAG. The Igwe twins weren't just there to do the norms but told their life story. Before this fine man was called on stage, i was wondering who could actually have gotten all this awards and Viola! it was Dayo Israel. This fine man is a born speaker. Damn! he's not just a speaker, he's got some spiritual action attached to it. This guy's story made the audience keep asking "how". Personally, i wanna meet this guy. 1. You are the only one who would limit your progress in life. 2. Step out of your comfort zone and fight in what you believe in. 3. Nothing in this world improves in time, you have to do something to make sure you are in the right direction. 4. You are able to do much more than anything that you think you can’t do. All u need to do is BREAKOUT!. 5. Associate with people that have a positive mindset, that thinks big, dreams big and aim for success. The people you associate with paints a PICTURE of your FUTURE. 6. Learn to continuously speak positivity in your mind. 7. There are many ways to reach to the top ( ona kan o w’oja mhen). 8. The only difference between ordinary and extra-ordinary is “EXTRA”. 9. The “extras” can be achieved through Your ambition: is your goal ordinary or extra-ordinary?. 10. Aim to achieve more society fixed mental blocks based on the ordinary life. 11. Fix yourself higher goals, challenges and target. 12. The difference between been a “dreamer” and “achiever” is ACTION. 13. Make good use of your talent to achieve what you want. (most people have lost it by following the trend, they dumped their talent to go in line with the trend). 14. Champions are people who commit to solving problems. 15. The place of your peculiarity is in your purpose. 16. One thing that can drive your passion inm life is business, talent, skill. 17. Focus on a particular thing, Carve a niche for yourself that can drive you. 18. Create a room for learning space. 19. Get a space to get informed; if you are not informed, you are jot transformed. 20. Think global, explore the internet, and explore the world of opportunities. 21. Strategize and have a timeline for everything you do. 22. Dare for more: There is more to life than you achievement. 23. If you deserve more, you must be ready to make a sacrifice. 24. What you choose to ignore determines what comes your way. 25. You must be willing to let go of something because what you let go of determines what comes to you. 26. If you want more, you must think unlimited. 27. Have a strategy; plan your journey. 28. Never let the opinion of others become your reality. 29. Be prepared for opportunities. 30. Be a person of value; when you have value, people would look for you. 31. Choose what you hear; people would say different thing. 32. If you put yourself in limitation as people that’s how far you can go. 33. Nobody has ever achieved greatness without starting. Do you know who you are?. Have you realized what it takes to be who you are?. What do you want to be known for?. Programmes like this is for everyone but not a source of change into everyone's life. Why? This' because we all get inspired,fine! for some, its for a short while( perhaps a week or two) while others take a step. what are the steps you take for that inspiration to make an impact in your life?. Believe me, before the programme ended, the level of inspiration in me was on a high level. Ahmean(I mean), God didn’t create specific people to be highclassed, semi highclasses, lowclassed. Na you go choose the clique wey you wan belong (You’d choose the clique you want to find yourself in).As for me, i've choosed mine and i'm taking a step already. Happy New Week to y'all and do have a fulfilled week ahead. For the first time, i stumbled on your blog and i love it. Your writeups are really motivating. I love the points you cover in this post for how to "be more"! Lately, I've been trying to stay highly motivated and on track with my goals and dreams. The biggest change has been the positive people I've kept in my life who have motivated me to work harder, stay focused, and still enjoy life. For instance, I recently reconnected with an old BFF from high school and together we've been becoming crazy morning people who work out at 6 am and then do work for the rest of day. Surrounding myself with positivity, like-minded people, and cutting down unnecessary social activities (which took up so much time and money) have really helped me to stay on track with work and school. Thanks for the great post and hope you are doing well! You're right Deb. I'm glad you shared your views and a bit of your experience here. You're welcome dear. Thanks, i'm very well.